1. It all starts as fun and games. 2. Suddenly, the news is discovered. That fun night has led to an unexpected, maybe expected, but still scary situation. A child is in your future. 3. At this point decisions need to be made. Traveling to a new state. Taking on a new job. These are all events that may occur upon discovering that a child’s life is now in your hands. 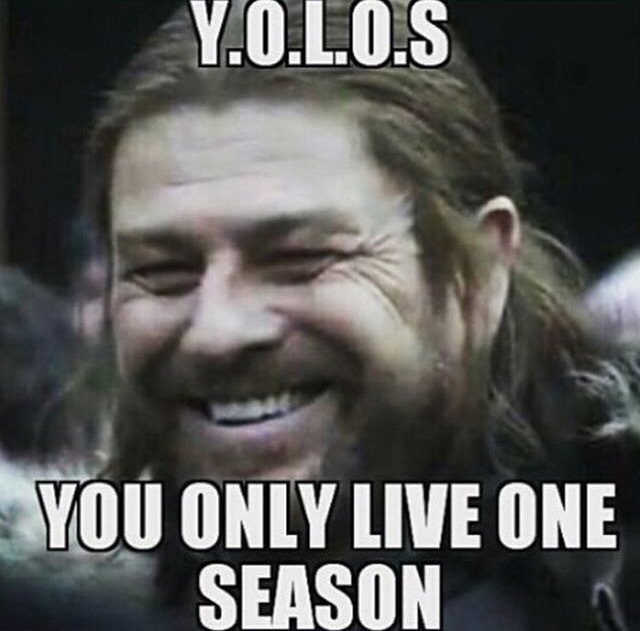 Let’s just hope it ends better for you than it did for Ned. 4. The night of the Red Wedding. Child birth is gross. Also beautiful, but really, really gross. Let’s be honest. Your life is basically over as you’ve known it. Soon after the birth of your child you’ll try just about anything to get them to eat, sleep and remain sort of a human being yourself. If the Lord of Light can help, you’ll be sure to summon him. 6. There will be battles. Lots and lots of battles. If the aforementioned eating and sleeping issues aren’t enough soon you’ll have tantrums, back talk and just the overall mess of children. 7. They’re basically like dragons. As the mother of dragons knows, parenting is difficult. Just be grateful they can’t fly around shooting flames. 8. Eventually, you discover something worse. Just as you’re thinking your kids can’t be any worse they start interacting with other kids. These icey ones will probably make you appreciate your dragons just a little more. 9. New bonds will be formed. Connecting with other parents is essential for your sanity. You’ll find unlikely comrades in the least likely places. Just watch your back, there’s always one mean girl in every group. 10. In the end your parenting will pay off. We won’t know what happens in GOT for another two years. It’s basically like parenting. It takes years to see all of your hard work pay off, but eventually it does. One day you’re sending your child off to kindergarten. The next thing you know they’re off to college and you’re going to miss those little dragons. Though that day feels an eternity away we all know it will be here in the blink of an eye.